Politicians on both sides of the Brexit argument "are going to have to accept some form of compromise," a Welsh Conservative MP has warned. David Davies' comments came after the prime minister's Brexit plan was defeated in the Commons for the third time on Friday. Theresa May is now considering ways of holding another vote on the withdrawal agreement. On Monday MPs will hold more so-called indicative votes on Brexit options. 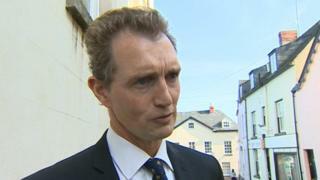 "I want to think very carefully about this over the weekend," Monmouth MP Mr Davies said. "We are all going to have compromise. "Clearly nobody's going to get exactly what they want here. "Unless both sides can accept some form of compromise I really don't know where this goes." Mr Davies, who has backed the prime minister in all three votes held on her deal, added: "I think we're just going to have accept to get something over the line, we may have to accept a lesser form of Brexit and a slower form of Brexit." Meanwhile on a visit to Newport ahead of an upcoming by-election, Labour leader Jeremy Corbyn criticised the prime minister for entertaining the idea of holding a fourth vote on her plan. "This is becoming a long running saga," he said. "She was supposed to have brought the vote on December the 11th - pulled it, put it at the end of January and lost by the largest majority a government's been defeated in parliamentary history. "Brought it back again, then again and now is apparently going to try it again next week. Plaid Cymru AM for Arfon, Hywel Williams, said: "It's extraordinary, isn't it. "The house has refused her deal three times now by huge majorities. Any other PM would've resigned by now. But I don't think she listens. "She hears what we say but she doesn't listen at all." Brexit: What do Welsh MPs think about leaving the EU?